I'll always remember these three words. It had been a long and difficult day and I was finally alone and free to spend a few (!!) minutes scrolling through my Instagram feed before going to bed, hopefully falling asleep straight away and then waking up at crazy o'clock to do it all over again. 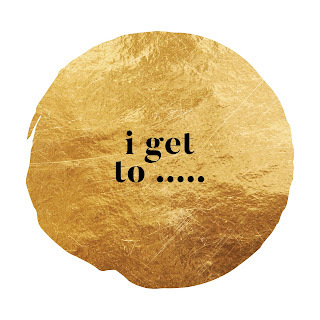 'I get to...' was the subject of a post of one of the many motivating and inspiring people I follow on The 'Gram. How embarrassing that I can't remember who it actually was. But thank you for your life changing wisdom. The idea of 'I get to...' is to replace 'I have to ... *insert eye roll and loud groan*...' with the challenge of 'I get to...' instead. It was at once both so obvious but also so hard. To simply change your intention regarding a specific task from resentment to possibility. that after paying the mechanic for all the stuff that needs to be done to my car, I'll have something safe to drive for at least another year for a cost that's much more palatable than buying a new car. What do you 'get to' do? OMG that concept is exacty what I needed to hear today. I had a massive meltdown over the weekend about all the things I have to do. This turns it all on its head. Have a great week. That's cool. Such little words. But packs a punch! I get to have a job where I can take it easy after a rough day of headaches yesterday. That's a really good message I'm going to try and apply to my life as well. Thanks for sharing that! Well, there we all are...we needed to read these words too! I GET TO...wonderful shift, for sure!